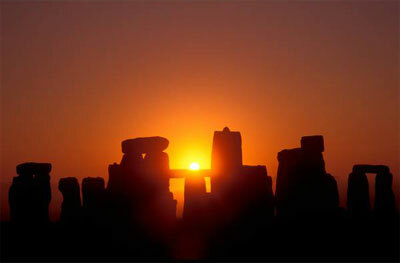 First Day of spring: Stonehenge crowd gathers for sunrise to celebrate the Spring Equinox. The first day of spring has been marked by 1000 revellers who gathered at Stonehenge to watch the sunrise. Every year, around this time, we start talking about the summer solstice. Mostly it’s because it’s the longest day of the year, and there’s a very British pessimism that says the days will immediately start to shorten into winter from now on. But there’s also the shenanigans at Stonehenge, general celebrations and a pause to celebrate the summer. It’s generally understood to mark the middle of summer – even though some of us may feel like we haven’t really had the first half yet in the UK. Technically, it’s when the tilt of Earth’s axis is most inclined towards the sun, and that’s why we get the most daylight of the year. In the winter solstice, we’re tilted furthest away from the sun, hence shorter hours of daylight and the shortest day. The word solstice is derived from the Latin words sol (sun) and sistere (to stand still). In the northern hemisphere, the summer solstice takes place between June 20 and 22. This year it’s on Monday, June 20. As it happens twice annually, the winter solstice in the UK is between December 20 and 22. In London on the summer solstice, the sun will rise at 04:43 and set at 21:21. Near Stonehenge in Salisbury, sunrise will be at 04:52 and sunset will occur at 21:26. The midsummer solstice is being celebrated at Stonehenge on Saturday into Sunday and at the Avebury stone circle from Friday until Monday. Thousands flock to the English Heritage site for the solstice in a tradition which has its roots in pagan times, when Midsummer Day was considered to have power. Of those who attend, many are druids, but some are tourists. This year it’s falling on a weekend for the first time in more than a decade and is expected to draw much larger crowds. The way that the stones are positioned is said to be aligned with sunrises on the two annual solstices. Although not much is known about its formation, those facts are thought to be involved with whatever religious, mystical or spiritual elements were central to its construction. The monument field at Stonehenge is open from 19:00 on Monday 20 June to 08:00 on Tuesday 21 June. Admission is free, but parking fees apply. 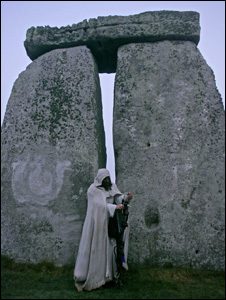 Visitors, including sunrise-worshipping Druids for whom it is a religious occasion, are encouraged to use public transport or arrange to car share. How else do people celebrate it? It’s not just for the arch-druids in Wiltshire – there are celebrations worldwide among lots of different cultures. The holidays, festivals and rituals do tend to have themes of religion or fertility. In Latvia there’s Jāņi, when women wear wreaths on their heads. Estonia has Jaanipäev or St John’s Day, which marks a change in the farming year. Wianki happens in Poland, with roots in a pagan religious event, and Kupala Night happens in Russia and Ukraine, where people jump over the flames of bonfires in a ritual test of bravery and faith. Are the days going to be shorter now? They will of course get shorter between now and the winter solstice on December 21, but don’t worry, we’re not talking early dark nights quite yet. Follow @St0nehenge @EH_Stonehenge @HighwaysEngland and @Wiltshirepolice for#summersolstice updates on the night. English Heritage is pleased to be providing Managed Open Access to Stonehenge for the Summer Solstice on 20th – 21st June 2015. Please help them to create a peaceful occasion by taking personal responsibility and following the Conditions of Entry and guidelines set out on these pages. CELEBRATING THE SUMMER SOLSTICE AT STONEHENGE Stonehenge is an ancient prehistoric site and has been a place of worship and celebration at the time of Summer Solstice since time immemorial. During Managed Open Access for Summer Solstice at Stonehenge, we support all individuals and groups conducting their own forms of ceremony and celebration providing that they are mutually respectful and tolerant of one another. Stonehenge is a place seen by many as a sacred site – please respect it and those attending. English Heritage continues to work closely with the many agencies and people from all sectors of the community and we would like to thank them for their help and support. Parking and entry to the Monument will be free, subject to the Conditions of Entry. Please do not arrive at the Solstice car park or Stonehenge in advance of the opening times listed below. Please note: As Summer Solstice this year occurs on a Saturday/Sunday, the roads around Stonehenge will be very busy. We strongly advise visitors to leave their cars at home and travel to Stonehenge using public transport. The nearest train station is Salisbury and there will be a regular bus service from Salisbury to Stonehenge. Please follow @eh_stonehenge on Twitter for travel updates on the night. Let’s start by winnowing out the mythical chaff from the factual wheat. The Druids didn’t build Stonehenge; they came on the scene about 2,000 years later, and – according to the Roman writer Pliny – they didn’t worship in stone temples but in ‘‘forests of oak’’. It was only in the 7th century that the antiquarian John Aubrey associated the Druids with Stonehenge. In 1740, a fellow neo-Druid called William Stukeley measured Stonehenge, and realised that its central line pointed ‘‘full northeast, being the point where the sun rises at the summer solstice’’. At that point, the link between Stonehenge, the Druids and the midsummer sunrise was set in tablets of stone. But hang on. Instead of standing in the centre of the great stone circle and looking outwards, you could equally well place yourself at the Heel Stone and look through the centre of Stonehenge, towards the south-east. That’s the direction where the Sun sets, at midwinter. In fact, Stukeley’s original account describes this bearing, with ‘‘the principal diameter or groundline of Stonehenge, leading from the entrance up to the middle of the temple to the high altar’’. So why did he choose the opposite direction as being critical to the Druids? Stukeley was a Freemason. For Masons, the western part of the sky is the direction of death. The north-east is spiritually all-important because it is the point where the Sun rises on the feast of St John (the traditional Christian date for midsummer, on 24 June). That’s why Stukeley picked out midsummer as the key season for Stonehenge. There’s no reason, though, to believe that our distant ancestors felt the same way. In fact, there are two great monuments in the British Isles which are unambiguous markers for the solstice, because they contain deep passageways that are lit up by Sun only once a year. In the case of Newgrange in Ireland and Maeshowe in Orkney, that date is the winter solstice..
Now archaeologists have provided the clinching evidence that Stonehenge, too, was erected to mark midwinter’s day. Mike Parker Pearson has excavated Durrington Walls, a huge settlement near Stonehenge. Here he’s found the remains of orgiastic feasts: bones of cows and pigs that had been brought vast distances – some from Cornwall, and others from the far north. Clearly, people came from all over the country to hold ceremonies at Stonehenge. And the bones reveal the season that they travelled. The growth of the pigs’ teeth, and the amount they had worn, showed that they had been slaughtered for the table at the age of nine months. Given that piglets are naturally born in the spring, Parker Pearson is adamant that people were ‘‘feasting on pork at midwinter most likely around the midwinter solstice’’. So, if you want to truly celebrate as our ancestors did, don’t go to Wiltshire this month. Instead, go to Stonehenge on 22 December, to view the sun setting behind the giant portals of stone. This month, two of our solar system’s most sensational planets are about to get together for a tryst. For the whole of spring, luminous giant Jupiter has been lighting up our evening skies. But dazzling Venus – Earth’s twin in size – has been sneaking up in the opposite part of the sky. Our neighbour world, cloaked in a dense atmosphere of carbon dioxide, reflects sunlight amazingly: it is the brightest object in the sky after the Sun and Moon. On 30 June, the two brilliant worlds tangle in a cosmic embrace. Separated by a space less than the diameter of the moon, Jupiter and Venus will make a stunning sight low in the western sky. 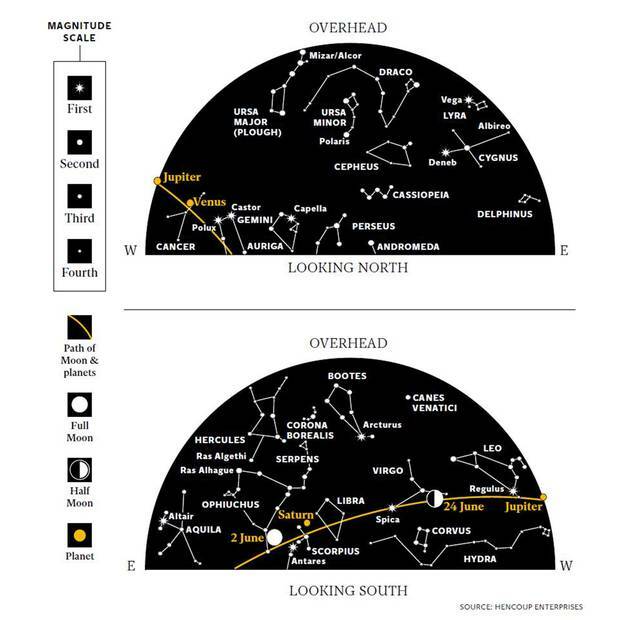 Otherwise, the summer constellations are making their appearance. Orange Arcturus, in Boötes, lords it over the night skies. Next to it, the small-but-perfectly-formed Corona Borealis – the Northern Crown – is a beautiful reminder that warmer days are on the way.